Cloudera Manager provides a Cluster Utilization Report that displays aggregated utilization information for YARN and Impala jobs. If you wish to export the data from this report, you can build custom reports based on the same metrics data using the Cloudera Manager Admin console or the Cloudera Manager API. This topic describes the metrics and queries you can use to build these custom reports. These reports all use the tsquery Language to chart time-series data. For more information about the Data Granularity described in these metrics, see Metric Aggregation. Many of the metrics described below use a data granularity of hourly. This is not required, but is recommended because some of the YARN utilization metrics are only available hourly and using the hourly granularity allows for consistent reporting. Time series of total cluster memory usage. Time series of total Impala CPU usage in milliseconds. The yarn_reports_containers_used_cpu metric used in this tsquery is generated per hour, therefore the data granularity used for this query is the raw metric value. Yarn memory usage. The yarn_reports_containers_used_memory metric used in this tsquery is generated per hour, therefore the data granularity used for this query is the raw metric value. CPU usage for an Impala pool. Provides CPU metrics per YARN pool and user. You can aggregate a pool-level metric from this query. Provides memory metrics per YARN pool and user. You can aggregate a pool-level metric from this query. The results of this query return the usage for each user in each pool. To see the total usage for a pool, sum all users of the pool. To view metrics for a specific pool, add poolName=Pool Name to the tsquery statement. Use the following metrics to monitor resource contention. 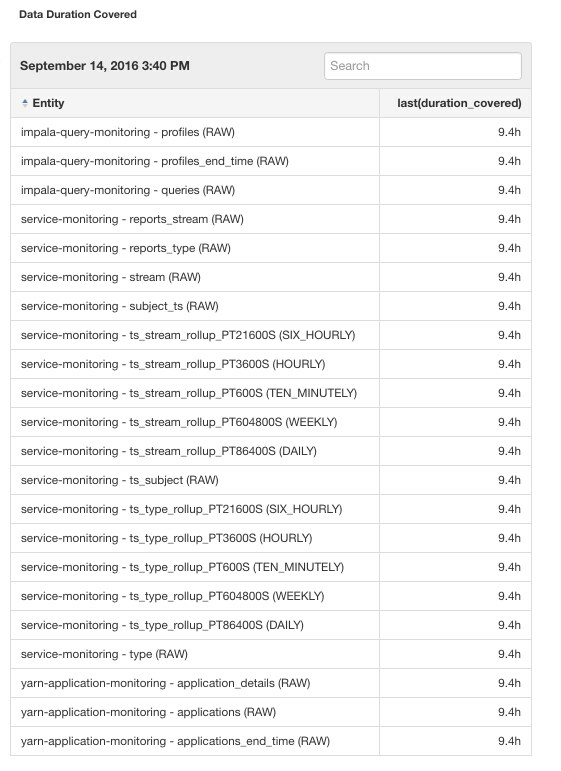 Note: To query for pool-level metrics, change the category to IMPALA-POOL in the above tsquery statements. All the metrics listed in this topic return a time series of metric values. Depending on the collection frequency of the metric itself and the data granularity you use when issuing tsquery statements, the results return metric values in different frequencies and therefore there are different ways to handle the metric values. YARN container metrics are generated once per hour resulting in one raw metric value every hour. Therefore, the most detailed results possible for YARN CPU and memory usage are hourly reports. Hourly aggregates are summarized from raw metric values. These aggregates include a set of statistics that include the sum, maximum, minimum, count and other statistics that summarize the raw metric values. When you use the hourly granularity, you lose the single values of the raw metric values. However, you can still get peak usage data for such metrics. For more information, see Metric Aggregation. For some of the YARN metrics described in this topic, the tsquery statement aggregates from the pool and user level to pool level in the Cloudera Manager Cluster Utilization reports. For these queries, because the maximum and minimum for different pool and user combinations are not likely to happen at the same time, there is no way to get the peak usage across pool and user combinations, or at the pool level. The only meaningful results possible are average and sum. When calculating CPU/Memory usage percentage, pay attention to the units for each metric. For example, if the cluster consistently has 8 VCores, the total VCore seconds for each hour would be 8 * 3600 VCore seconds. You can then use this adjusted number to compare with the VCore seconds used by YARN or YARN pools. There is a Time series endpoint exposed by the Cloudera Manager REST API. See Cloudera Manager API documentation timeseries Endpoint. The API accepts tsquery statements as input for which metrics need to be retrieved during the specified time window. The API provides functionality to specify the desired data granularity (for example, raw metric values, TEN_MINUTES, HOURLY etc.). Each granularity level of data is maintained in a leveldb table (see Data Granularity and Time-Series Metric Data). This data is aggregated from raw metric values such as minimum, maximum, etc. within the corresponding data window. For example, if you do not need the metric data at a specific timestamp but care more about the hourly usage, HOURLY data should be good enough. In general, the longer the granular window it is, the less storage it is taking, and thus the longer period of time you are able to keep that level of data without being purged when the storage hits the configured limit. In the case of Cloudera Manager Cluster Utilization Reports, Cloudera Manager generates the reports based on an hourly window. To view the Cloudera Manager Service Monitor data storage granularities, go to Clusters > Cloudera Management Service > Service Monitor > Charts Library > Service Monitor Storage and scroll down to see the Data Duration Covered table to see the earliest available data points for each level of granularity. The value in the last(duration_covered) column indicates the age of the oldest data in the table. To configure the Time series storage used by the Service Monitor, go to Clusters > Cloudera Management Service > Configuration > Charts Library > Service Monitor Storage and search for "Time-Series Storage". To build charts that query time series data using the Cloudera Manager Admin console, go to Charts > Chart Builder. When building charts, it may be useful to choose the data granularity by clicking the Show additional options link on the chart builder page and then selecting the Data Granularity drop-down list. See Charting Time-Series Data.